We continue to work with the Federal Transit Administration (FTA) to make sure all comments submitted by the public regarding Ashland BRT are fully addressed. The agency’s current focus on BRT is working with the Chicago Department of Transportation (CDOT) on the Central Loop BRT project. In April 2013, CTA and CDOT announced a vision for a center running Bus Rapid Transit (BRT) system on Ashland Avenue between Irving Park Road and 95th Street to provide a fast and reliable north/south transit connection for 16 miles through Chicago. The vision reflects the planning process and community engagement undertaken in 2012. Over the summer, CTA and CDOT heard from various key stakeholders about this plan. We then held a public comment period as an extension of this outreach to gather additional input from the public. Two public open house meetings were held on December 10 and 11, 2013 as part of this comment period (see the materials presented at the meeting). CTA and CDOT are still developing the Ashland BRT design, and we are considering options and modifications, including the implementation of additional left turns, based on continued feedback from the public. The public open house meetings summarized studies of the project impacts, including traffic analyses, which have been performed as part of the formal Environmental Assessment for the project, in accordance with federal government requirements. The Environmental Assessment is now complete and available online. Although the formal EA public comment period has ended, CTA and CDOT would still like your comments on the Environmental Assessment, which can be e-mailed to AshlandBRT@transitchicago.com. CTA and CDOT will consider the results of the analyses, potential impacts and strategies for mitigation, and all public comments before moving forward with the next phase of the project. In addition, there will be additional public input solicited as part of the next design phase. Detailed information about the project and previous phases of the planning process is included below. We’ve also developed several videos to explain Ashland BRT and the planning process. What is an EA (Environmental Assessment)? How Will a BRT Station Work? The CTA, in partnership with the Chicago Department of Transportation, the Chicago Department of Housing and Economic Development have been pursuing a vision for Ashland Avenue that would provide fast, reliable and convenient transportation. Since 2012, our agencies have worked to develop a long range plan of Bus Rapid Transit along a 16-mile stretch of Ashland from Irving Park to 95th Street. The vision includes dedicated bus lanes, signal priority for buses, limited stops and enhanced customer amenities at bus shelters. The latest step in this process includes the publication of the Environmental Assessment (EA), which is a document that provides a detailed assessment of social, economic, and environmental impacts of the project, and has been completed for the project, in accordance with federal requirements. CTA and CDOT held a formal public comment period that ended December 20th, 2013, but are still seeking additional public comments on the EA and the project plans (see the Appendix G). Public comments will provide direction on the project’s next phase of design. Bus Rapid Transit (BRT) is a term applied to a variety of bus service designs that provide for faster, more efficient and more reliable service than an ordinary bus line. Often this is achieved by making improvements to existing street and traffic signal infrastructure. Ashland BRT would provide a transit option about as fast as driving for neighborhood residents, with an increase in bus speeds of up to 83, and a 50 percent improvement in reliability, keeping buses running regularly and on-schedule, and making travel times more predictable. The Ashland Avenue corridor is a key north-south connector that has seen residential and employment growth and is expected to attract more. According to the Chicago Metropolitan Agency for Planning, the population living within a half-mile of Ashland between Irving Park Road and 95th Street is expected to grow by 55,000 (or about 24%) by 2040. Providing a competitive transit option makes room for economic growth. BRT has been shown to be an economic driver for a corridor, since it provides fast and reliable transit access similar to rail, which can improve access to jobs, increase foot traffic for neighborhood businesses, attract investment, and spur development. Ashland Avenue has the highest bus ridership of all CTA routes, with 10 million boardings in 2012—more than 31,000 per weekday. Currently, 1 in 4 households located within walking distance of Ashland Avenue do not have a car. 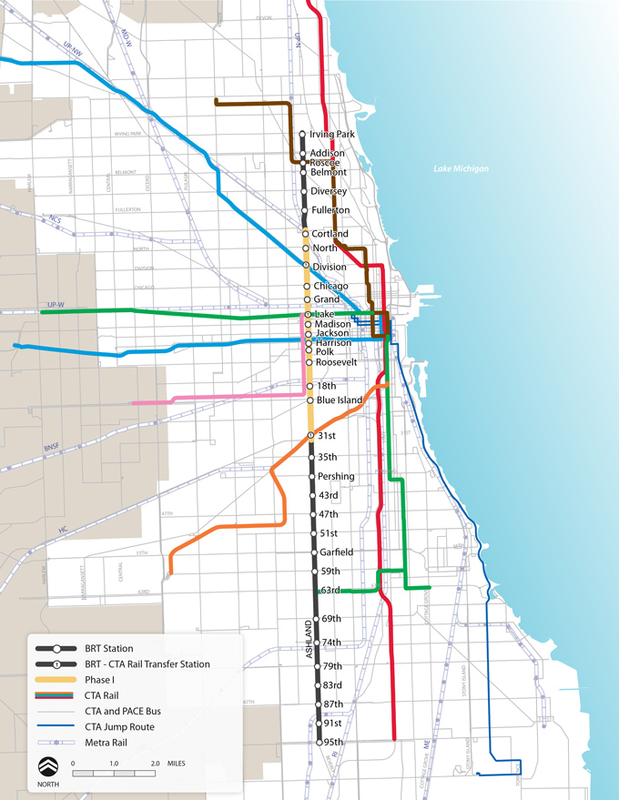 The full 16-mile Ashland BRT would connect with seven CTA ‘L’ stations, two Metra stations, and 37 bus routes, and provide a much-needed north-south transit connection outside of the downtown area. This corridor provides access to nearly 133,800 jobs, including large employment centers such as the Illinois Medical District, and serves popular destinations like UIC, Malcolm X College, and the United Center. There are also 99 schools within walking distance of the proposed Ashland BRT. The proposal to construct BRT on Ashland Avenue includes streetscape improvements that would increase safety and pedestrian comfort, including improved lighting, ADA ramps, platforms that provide pedestrian refuge when crossing the street, and removal of left-hand turns, which are a major cause of vehicle accidents. The configuration for BRT on Ashland (also known as the “Preferred Alternative”) offers riders faster, more reliable service and new, amenity-filled stations with enhanced, landscaped medians between stations and along sidewalks. Local bus service will remain. Dedicating two general travel lanes (one in each direction) as center-running bus-only lanes, typically leaving one in each direction. Two auto travel lanes in each direction will remain where there are currently three travel lanes (between Lake Street and Roosevelt Road). Small reduction in parking; approximately 90% of parking and loading zones retained on both sides of the street. Most left turns removed; left turns at highway access points retained. The Ashland BRT design is still being developed. CTA and CDOT are considering options and modifications, including the addition of some left-turns to the design, and we want your feedback on the current proposal. How would travel times compare? Graphic: Travel times shown reflect estimates based on the proposed center running design alternative for Ashland BRT, and Red Line operation during the fastest times of day and with no slow zones along the Dan Ryan branch. This map shows proposed stops along the complete 16-mile Ashland Avenue corridor, and the proposed first phase from Cortland Avenue to 31st Street is shaded in yellow. The potential traffic impacts of the project are very important to identify. To better understand these impacts, CTA and CDOT have conducted traffic counts in 2013 and used industry standard traffic models, including the CMAP Highway Model and SYNCHRO, to conduct traffic analysis. CTA and CDOT will continue working with the community on traffic-related matters through all phases of the project. – this version is a large file size and may take time to download if you do not have a high speed internet connection. – this version contains all of the same information as the Full File Size version, but some graphics may be lower resolution. All of the following links are to PDF documents. Some appendices are divided into several parts because of large file sizes. Accessible format versions of the appendices are not available online due to their size. To access an accessible format version of these appendices or if you have other questions related to the accessibility of these materials for the visually impaired, please call 312-681-4279. See below for locations where hard copies are available. An Environmental Assessment (EA) is a document that summarizes the results of technical analyses and reviews both positive and negative effects of a proposed project on different social, economic, and environmental factors. It considers all options and impacts and allows the CTA to work with communities to create the design that best meets the needs of each neighborhood. An EA allows the FTA to assess any potential impacts in order to determine whether to provide approval to proceed with the project. An EA is required by the FTA for certain types of projects seeking federal funds. What does the EA for Ashland BRT analyze? What were the findings? The EA for Ashland BRT documents the full range of possible positive and negative effects of the project along the full 16-mile corridor from Irving Park Road to 95th Street. This process analyzes the impacts of the Preferred Alternative configuration (the “Build Alternative”) as compared to existing conditions (the “No Build Alternative”). The EA identified potential positive or negative impacts with respect to traffic, parking, neighborhoods and communities, noise and vibration, air quality, energy, and construction. A summary of the EA findings is included in the Environmental Assessment Summary (.pdf) (text version, .pdf). How can I see what Ashland BRT would look like on my block? In conjunction with producing the EA, CTA and CDOT have also been developing conceptual engineering plans, or “concept designs” for the 16-mile Ashland corridor. These are still preliminary, but they include enough engineering detail to evaluate the impacts of the proposed improvements, which are documented in the EA. These concept designs are included as Appendix G.
The formal comment period for the EA has ended, but Wwe want to hear what riders, residents, business owners and others affected by BRT have to say about the project plans on an ongoing basis so that we can consider those needs and concerns as we develop more detailed designs of each section of the corridor. Concept designs are included for review and comment as Appendix G of the EA. Public comments will help inform the next phase of design. The detailed project plans will be updated based on public input. CTA and CDOT are also committed to additional public meetings as part of the next phase of design. Comments received during the official EA comment period (November 19th to December 20th, 2013) and responses to these comments will be available on the CTA website once the review of comments received during the comment period is complete. Comments made during the 30-day comment period will become official record for the Environmental Assessment. Comments received outside of the formal comment period began will also be taken into account and inform the next phase of design, but may not be included in the official record for the Environmental Assessment. Tuesday, December 10, 2013 6:00 - 8:00 P.M.
Wednesday, December 11, 2013 6:00 - 8:00 P.M.
To receive information about future public outreach efforts, please see How to Stay Involved. We arrived at the vision for BRT on Ashland after conducting an Alternatives Analysis in 2012, a year-long planning study to assess options for BRT on Ashland and Western Avenues. During the Alternatives Analysis process, CTA and CDOT conducted technical analysis and held six open houses to garner public input, and additional meetings were held at the request of stakeholders. Dedicating two general travel lanes (one in each direction) as center running bus-only lanes was chosen as the best configuration to address community concerns. This configuration aims to increase bus speeds, enhance streetscapes, preserve medians and parking, decrease congestion and improve safety. How We Got Here (text version) – A summary of the project background, process, and Alternatives Analysis results. CTA is currently reviewing comments received during the formal comment period, which ended December 20, 2013. See above for more information about the public meetings, how to comment and how comments will be addressed. The next step is to begin developing detailed designs for the 5.4-mile Phase 1 area, from Cortland Street to 31st Street, taking into account public comments and technical analyses. All phases listed above include public engagement. To learn more about Bus Rapid Transit in Chicago, including other projects and events, visit BRTCHICAGO.com.